The hashtags function in the same manner for CONTRACTS and OFFERS and INVOICES. "A hashtag is a type of metadata tag used on social networks such as Twitter and other microblogging services, allowing users to apply dynamic, user-generated tagging which makes it possible for others to easily find messages with a specific theme or content." On Optune, the hashtags are meant to represent specific information that you've already added to your Agent account or to your artists' bookings. Their "specific theme or content" is the data that you would like to have visible in your contracts or offer sheets. The best way to understand the hashtag system is to first enter a booking into your account. From your Dashboard, click on the "+" button at the bottom right of the page and select Add Booking. If you've already entered a booking and all of it's information into your account, then you can skip to PART 2 of this manual. This will bring you to the Booking Overview. Start adding the primary information to the booking, like "START DATE", "ARTIST", "EVENT TYPE", "VENUE", etc. It is this information that the hashtags will later represent. Now scroll down until you reach the DEAL card. Again, enter the booking information. When you've filled in as much as you can, move down the page to the Itinerary section. Here there are several distinct cards in which you can add more details regarding play times, ticket information, and the show schedule. Add the information you have thus far, and when you're done click on Save Booking at the bottom of the page. This returns you to the top of the booking that you've just entered into the Booking Overview. Scroll down until you reach the CONTRACTS & OFFERS card and select it. Then click on Create new Contract / Offer. 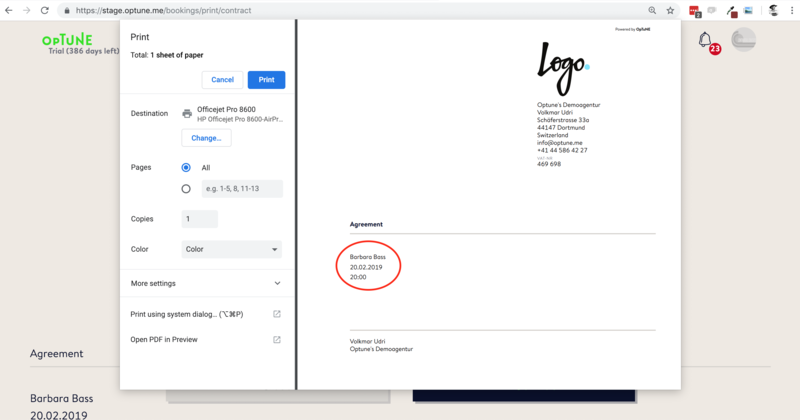 This is where you can create a contract for your booking and save it as template for future use, applying it to other bookings. For the purpose of learning about the hashtags, we won't worry about creating a proper contract now. We'll simply focus on explaining how the hashtags function. Click on the following applicable words to view our FAQ's about creating contracts and offers. Now, scroll down until you reach the Available hashtag-library. You can see the hashtags that Optune offers on the left, and on the right is a brief explanation of what each hashtag will display in your document. To show you exactly how this works, highlight and copy the first hashtag #artistName. Now scroll up to the document creator, delete the default text, and paste the hashtag there. Repeat this step with the next two listed hashtags, and then click on PREVIEW PRINT at the top right of your page. Here you can clearly see what your document will look like when printed (or as a pdf). MOST IMPORTANTLY, NOTICE HOW THE HASHTAGS HAVE BEEN REPLACED BY THEIR CORRESPONDING INFORMATION. THIS INFORMATION HAS BEEN TAKEN DIRECTLY FROM THE BOOKING, THE ONE WE JUST FILLED OUT MOMENTS AGO IN THE BOOKING OVERVIEW. The hashtags #artistName, #bookingDate, and #startPlayTime have been replaced by the correct information. There are three specific hashtags in the Available hashtag-library that are slightly more complex. Let's review them by returning to the contract creator. 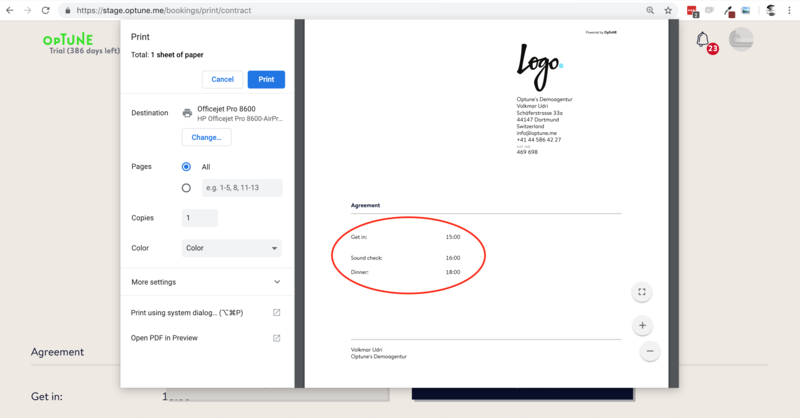 Click Cancel on the print preview, and then Close on the Contract Print page. When applying any one of these three hashtags to your contract, you must follow each hashtag with its corresponding number so that each item is transferred accordingly. In this case, #schedules will become Get in, #schedules will become Sound check, and #schedules will become Dinner. To show it in practice, let's return to our document creator and enter the three hashtags, manually adding the square brackets and numbers to the end of each one. Then, as before, click on Preview Print at the top of the page. Once again, see how the hashtags have been replaced by the information that you previously entered into your Booking Overview, and that they are displayed as an itemized list. With this knowledge of how Optune's hashtag system operates, you can now begin creating your customized contracts and offers. When you save those documents as templates, and apply the templates to other bookings, the hashtags will represent the information from the particular booking for which you're creating the new contract or offer.